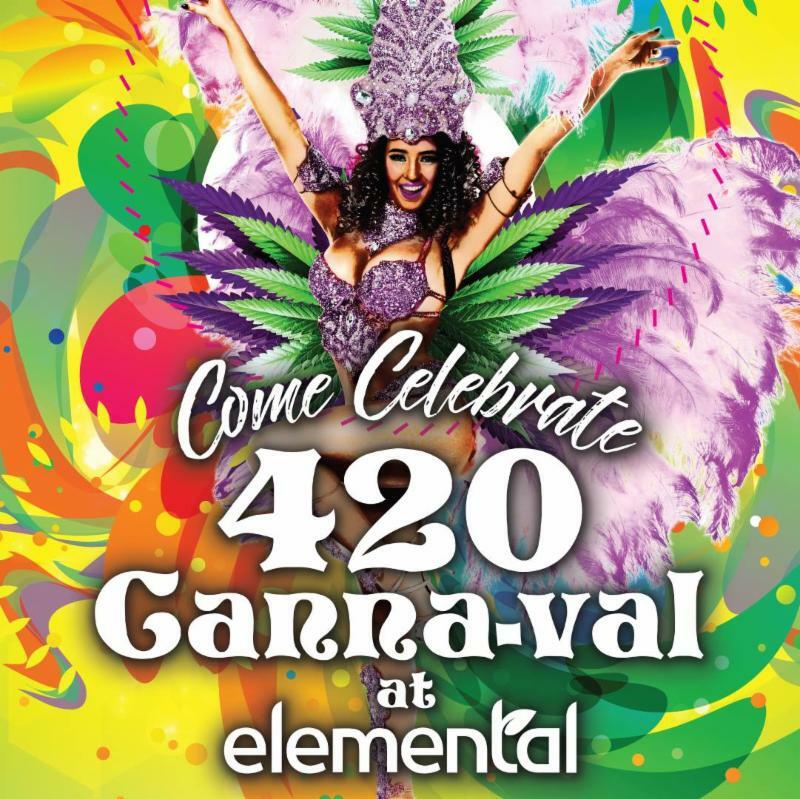 420 is nearly upon us, and Elemental is again geared up to throw the South Bay’s biggest bash! If you’ve joined us for any of our celebrations in years past, then you know what an extraordinary event awaits you this Friday! Yes, it’s true we have a monumental list of once-a-year specials awaiting, but Elemental has always gone above and beyond to make certain that our members’ 420 is a day to remember, and this year is certainly no exception! In previous years we’ve hosted a magical Alice-in-Wonderland-themed gala, a wacky carnival event, and an out-of-this-world 5th Element shindig. This time around, members can break out their vibrant clothing and masks as our 420 Canna-val is set to be our largest extravaganza to date, and uncoincidentally, the first time we’ll be welcoming all persons 21 years or older with a valid, government-issued ID! Members seeking bulk flower specials will definitely want to arrive early -- our doorbuster $99/ounce specials on Huckleberry Soda Minis, Mother’s Milk Minis, Purple Pleiades Minis, and Mini Mix (save $111, limit 1 each) won’t last long! Members arriving later in the day will still be privy to a load of other enticing flower specials including, but not limited to: Lemon Haze 13 at $35/quarter (save $35, limit 1), Cherry Chem from FlowKana at just $60/half ounce (save $50), six varieties of shake at $4.20/eighth (save $10.80, limit 3 each), and more! Additionally, look for several Connoisseur Cone strains on sale for just $4.20/each (save $5.80, while supplies last) and our Mixed Blend cone on sale for just $1/each (save $7, while supplies last)! Fear not, concentrate connoisseur, we haven’t forgot about you! We have colossal cuts lined up across the menu, including 2-for-1 on all Creme de Canna shatter, 2-for-1 on all Utopia live resin, Sour Tangie Sauce at $30/gram (save $10, no limit), 15% off all Nasha Extracts cold water, and much more! For our members who value discreteness, we have several cool cartridge deals prepared including: $29 Elemental Premium Vaporizers (save $10, no limit), 2-for-1 Sublime Cartridges (limit 1, from 1pm-5pm only) $29 Dabblicious Vaporizers (save $10, comes w/ free battery), and more! Moreover, our members who prefer munchies also have delicious deals to look forward to: 2-for-1 Utopia macaroons (no limit), buy one and get one half off on all Plus Gummies, Kushy Punch samples, and more! Additionally, EVERY MEMBER who visits us on 4/20 will receive a FREE GIFT just for stopping by. Hourly raffles for premium glass and more will also be offered for members attending. Lastly, don’t blow your chance at some great live entertainment -- skilled glassblowers Cool Hand Suuze and Hazardman will be putting on an amazing live demo beginning at 10:30am. They’ll be working on several pieces, and will be taking requests on pendants that will be available for purchase after the show! And we’re doubling up on the entertainment this year, as the talented Samba Conmigo will also be performing authentic samba later in the day! Basically, we have an action-packed day full of once-a-year specials, awesome live entertainment, and nothing but positive vibes planned for our wonderful members on 420 -- we hope to see you there!